Transform your photo into an heirloom tapestry wall hanging. Makes the perfect gift. 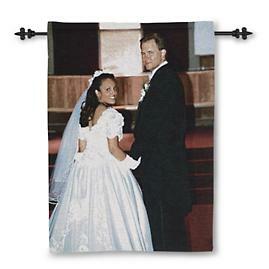 Ideal for special anniversaries, graduation, class reunions, weddings, family portraits, sympathy, in memory of, pet lovers, etc. This kit contains easy step-by-step instructions to submit your photo for weaving. 1. Purchase the Photo Kit from 3BGifts.com. 2. Then you or the gift recipient selects the perfect photo. 3. Mail your photo or digital CD via the kit's enclosed photo mailer or submit your selected image via the website listed in the instructions included with the kit. It's That Easy! You are "ready to display" a heirloom tapestry throw which will be shipped back to you in approximately 4-6 weeks. Finished Product: Jacquard woven from 100% cotton. Spot or dry clean only. NOTE: REMEMBER YOU CAN GIVE THE KIT AS A GIFT AND THE GIFT RECEPIENT CAN MAKE THEIR OWN PHOTO SELECTIONS.